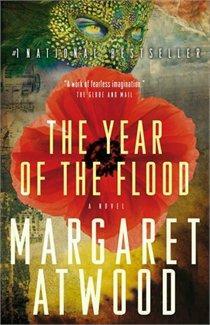 The Year of the Flood is Margaret Atwood’s follow up to Oryx & Crake. Rather than write a direct sequel, The Year of the Flood’s events occur alongside Oryx & Crake, acting as a stort of expansion on the original story. The story follows Toby and Ren, two of the three people Jimmy comes into contact with at the conclusion of Oryx & Crake. Being former members of the cult, God’s Gardeners, the novel tells their stories leading up to the great “waterless flood” – the apocalyptic plague unleashed at the conclusion of O&C. I enjoyed Year of the Flood more than O&C but I feel that’s probably because Atwood did such a great job in laying the foundation with the first novel. If I wasn’t aware of the inner workings of the CorpSeCorps, the mega-corporations playing God, or the story of Crake and Jimmy the Snowman, I might have found it slightly lacking. Then again, that’s a weird complaint as this book wouldn’t exist without O&C. That being said, most of the complaints regarding Year of the Flood seem to stem from the fact that there is no real plot advancement from the final pages of O&C. Typically, if you’re picking up a second book in a series, you expect to end up in a different place than the end of the first novel. Although with YofF, Atwood fleshes out the world created in O&C by injecting new and dynamic characters that help to set the stage for the third book, Maddadam. To try and cram all the characters and story laid out in YofF into O&C, you would be left with a bloated, scattered mess. I’m looking forward to the third in the trilogy. Atwood seems to excel at breaking her readers’ hearts so I’m hoping she is going to leave things on a more uplifting note. July 22, 2015 in Fiction, Margaret Atwood.